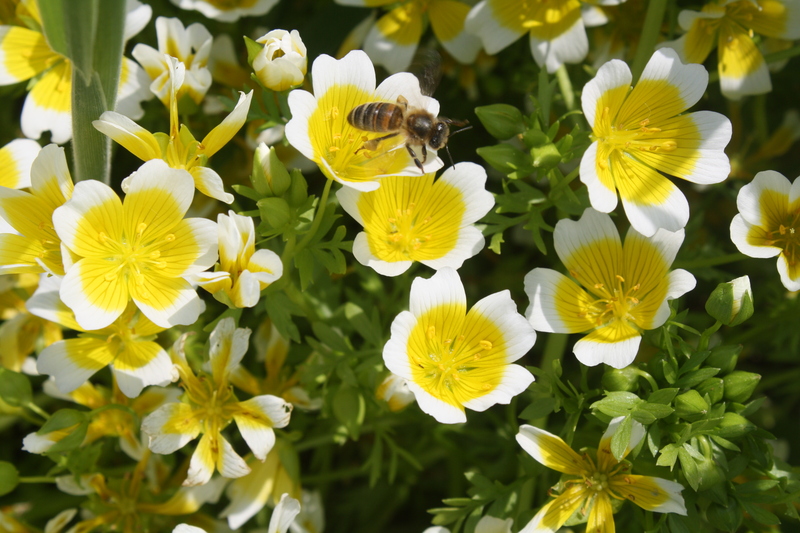 Poached egg plants are very popular with honey bees. That was very clear today as I watched good numbers of them buzz around and then wriggle around inside the bright yellow and white open flowers. 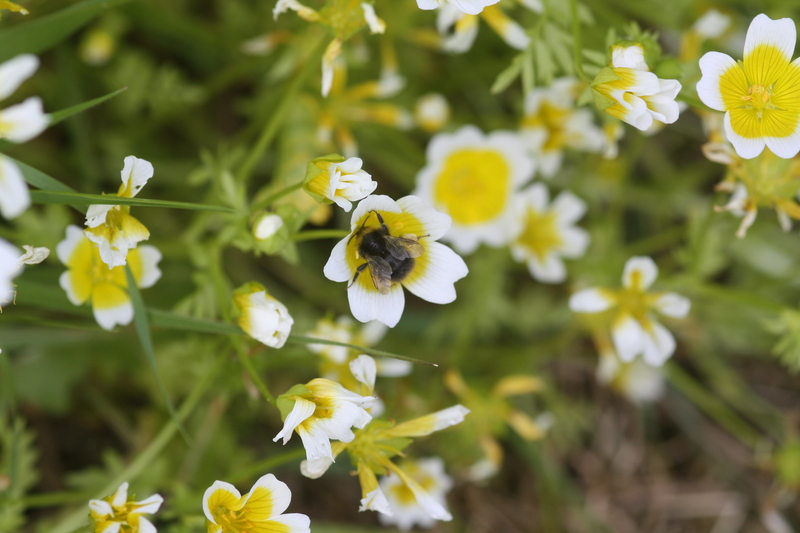 My husband has a large patch of the poached egg plants on his allotment in South Wootton, near King’s Lynn, and we’ve often noticed that they are a real draw for the bees. Today, the seventh day of the Wildlife Trusts’ challenge to do something wild every day for 30 days, I joined him to have a closer look. We must have counted at least 20 honey bees – it was very tricky to do as they were on the move the whole time, racing around trying all the flower heads they could. A honey bee on a poached egg plant. These flowers are aptly named because of their white edges and egg-yolk yellow middles. They are fairly round in shape and if you look closely into them it is possible to see they have lines running down from the edge of the petals to the centre. These lines are like runways, guiding the bees in towards the pollen and nectar in the middle. A poached egg flower showing the “runways”. There were two other types of bee about the plants this morning; I wasn’t sure what species they were. Another type of bee visits the flower. The poached egg plants had also attracted a hoverfly and two other insects. One of these other insects was slender, shiny green with fat green thighs on its hind legs, and long antennae, and the other was also slender with a body that glittered gold, silver and green as it moved in the hot sunshine. My husband also has a comfrey plant on the allotment, and there were several bees around this, although I didn’t see any honey bees. The comfrey flowers are long and tubular and therefore would attract bees with tongues long enough to reach the pollen and nectar inside. A seven-spot ladybird was also on the comfrey. A bee visits the comfrey. Thanks for the information – my book only gives the scientific name for the green beetle. 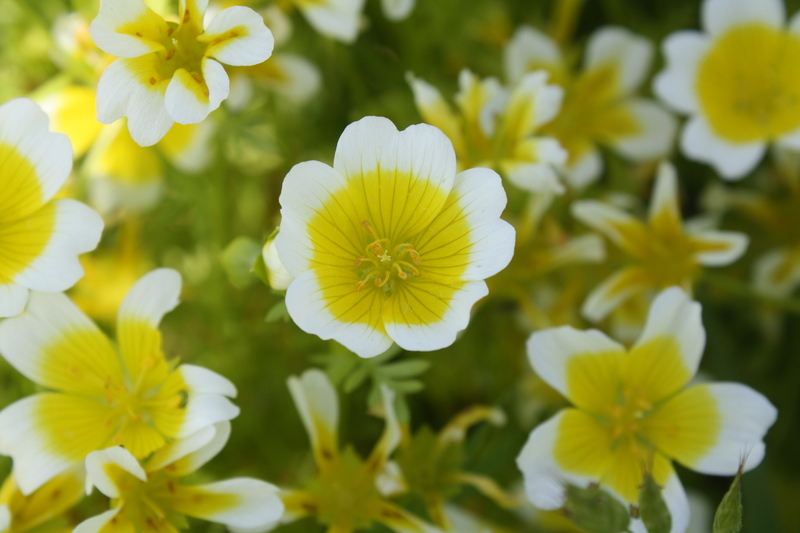 I think the poached egg plants are really cheerful. Superb photographs of the poached egg flowers, so clear!